It’s that time of year, my friends. Time to cook the annual corned beef dinner in honor of St. Patrick’s Day. A strange fact struck me as I sat down to write this post. I’ve cooked a corned beef every year of my adult life. The tradition started when I first moved out on my own at nineteen and has continued to this day. That’s a lotta corned beef. Those big briskets almost always yield more than we need for dinner which means leftovers. I’m a happy lady when we have leftovers in this house. It brings peace and joy to my life to know that one more meal is handled. 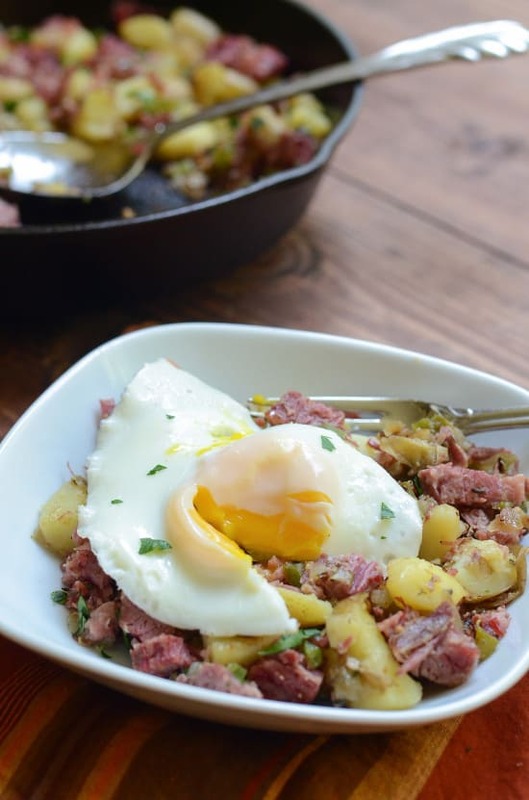 In my opinion, hash and eggs is one of the best things that can happen to leftover corned beef. 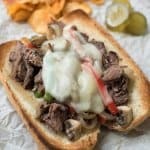 In fact, this dish is so good it’s worth picking up an extra brisket when the stores slash their prices the day after the holiday, just for this purpose. A cast iron skillet works perfectly so use it if you’ve got one, but any 10″ of 11″ skillet will do just fine. Let’s start this off by sauteeing some diced onion and bell pepper in olive oil over medium heat till softened. Add a little minced garlic and cook for another minute or so. 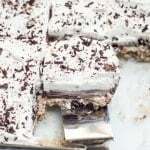 For the exact measurements, take a look see at the printable recipe at the bottom of this post. 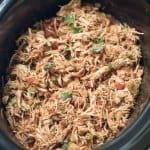 You’ll need a couple of cups of cooked, chopped potatoes so plan ahead and make plenty so you’ll have some leftover from your meal the night before. 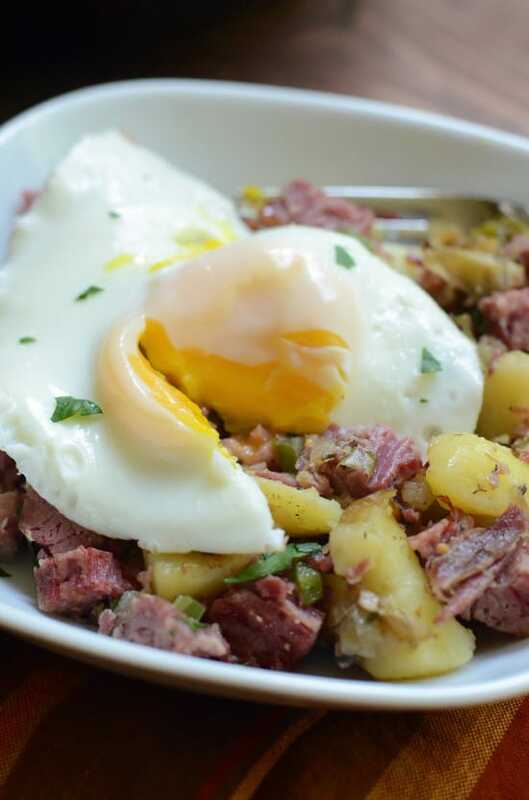 What you see here are mini Yukon golds that I boiled whole when I prepared my Guinness Corned Beef – my absolute favorite method. Small red potatoes are also a great choice. 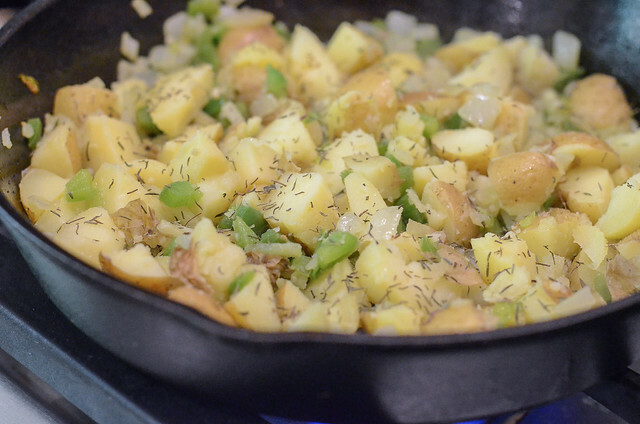 After adding the chopped potatoes to the skillet, season the mixture with dried thyme, a touch of salt, and fresh ground pepper. You want to go easy on the salt at this point, especially if your cooked potatoes were seasoned. Cook, stirring occasionally, until the potatoes are golden brown. This is where the cast iron pan helps immensely. 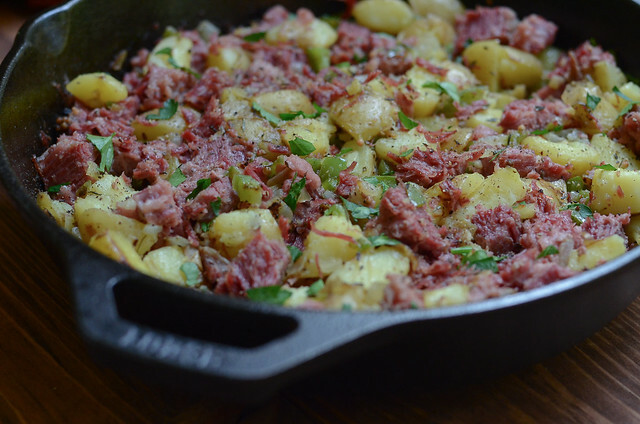 Add your cooked and chopped corned beef. Cook and stir just until the corned beef is warmed through. Don’t cook longer than a couple of minutes or you risk drying it out. Using the bottom of spatula or the back of a wooden spoon, firmly press the mixture down into the skillet. Give it a taste and season with additional salt and pepper, if needed.To brighten things up a bit, I garnished it with a little chopped, fresh parsley. Our beautiful hash is good to go. Time to move on to the eggs. Lots of folks will cook their eggs right over the top of the hash but I like to cook them separately and then plop one on top of each individual serving as it’s plated up. I think the eggs cook up better and are definitely prettier when cooked solo. 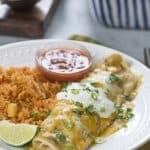 If you are a fan of fried eggs, click HERE for a very clever method for cooking perfect “over easy” eggs from Kayle, The Cooking Actress. 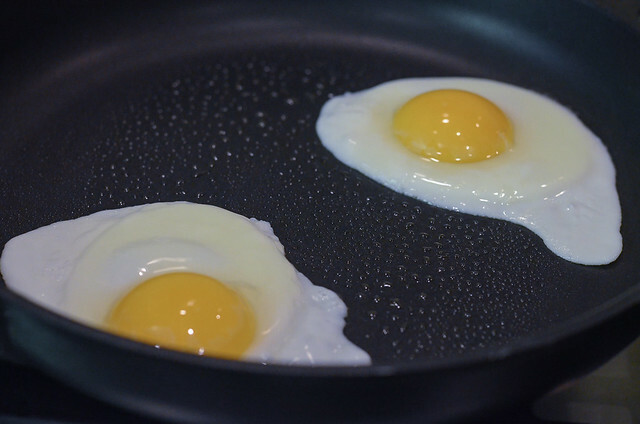 This is now my go-to method for frying eggs and it works like a charm. You must try it. Thanks, Kayle! 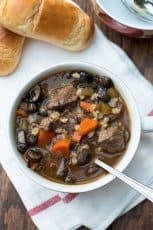 Hearty enough for dinner or one very substantial, comforting breakfast. 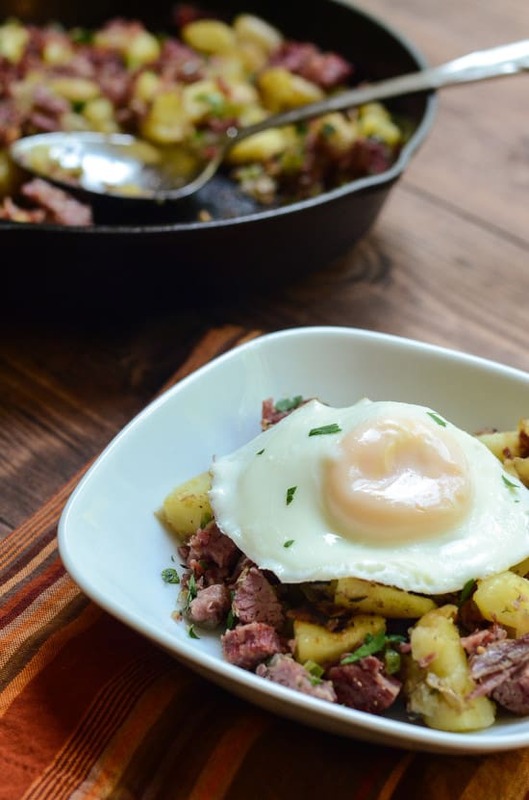 Hash is one of the best things that can happen to leftover corned beef. 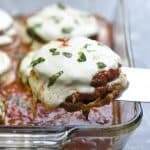 Hearty enough for dinner, it also makes for a delicious, comforting breakfast. Coat a 10" skillet with 2 tablespoons olive oil and place over medium heat. Add diced onion and bell pepper. 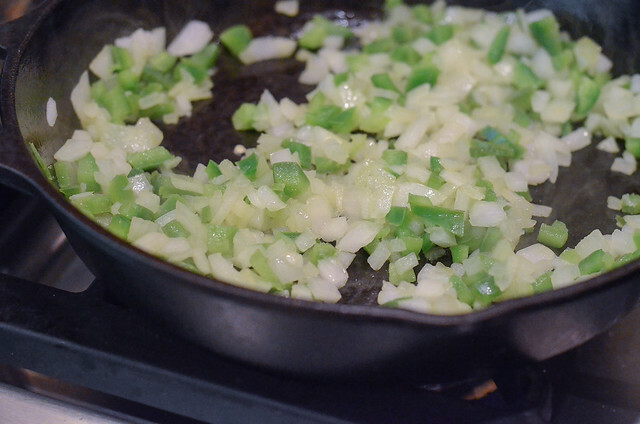 Cook, stirring occasionally, for about 4 or 5 minutes or until onion and bell pepper have softened. Add minced garlic and cook, stirring, for another minute. 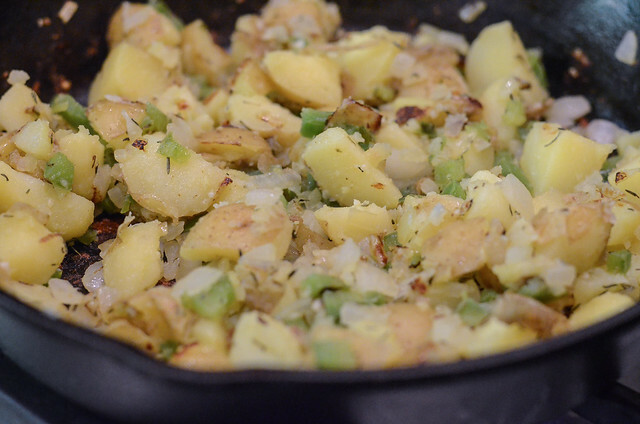 Add the cooked, chopped potatoes. Season the mixture with 1/2 teaspoon dried thyme, 1/2 teaspoon salt, and pepper to taste. Cook for another 4 to 5 minutes, until potato has lightly browned. Add chopped corned beef and cook just till corned beef has warmed, about 2 minutes. Press down on the hash with a spatula or wooden spoon to flatten down into the pan. Taste and season with additional salt and pepper, if desired. Remove from heat and set pan aside. Cook eggs as desired. Serve a cooked egg over each individual portion of hash. 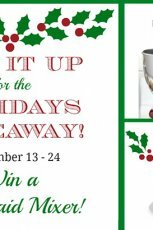 Mix it Up for the Holidays Giveaway!!! 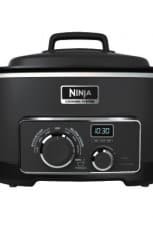 Ninja Cooking System Review and Giveaway! Yayyyy! so glad the egg method worked for you! This hash looks sooooo good! 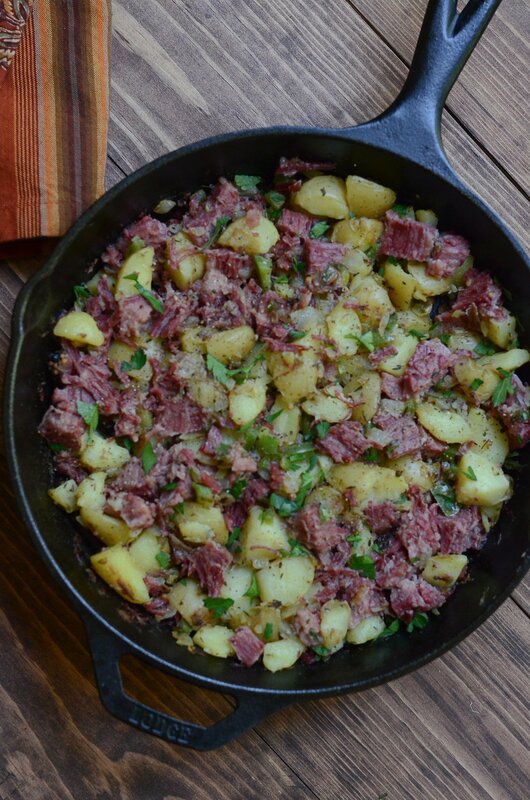 I think my husband’s favorite part of corned beef and cabbage is the left over meat that is turned into hash. Yours looks great. 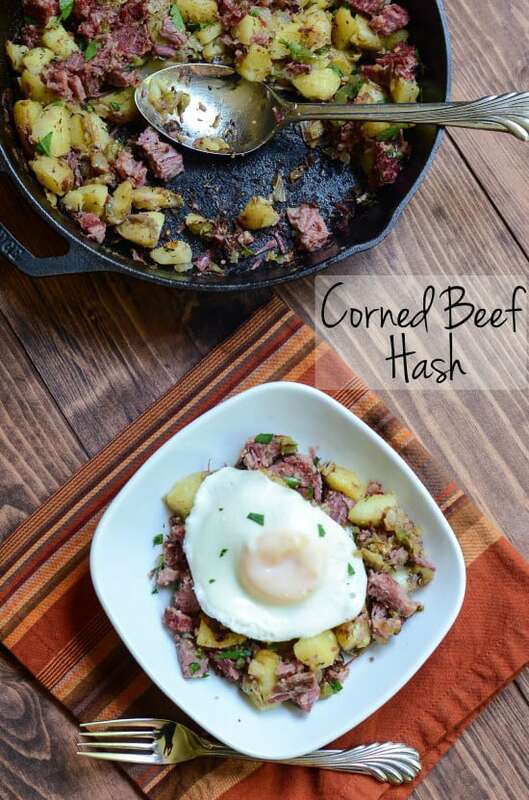 It’s recipes like these that make me wish my hubby liked corned beef! 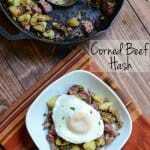 Your hash looks amazing!!! We waited till AFTER ST. Patty’s Day to get a brisket, thinking that they’d be on sale, but no such luck, in fact, most of the stores were sold out of ’em. We ended up getting one at Wal-Mart, of all places. 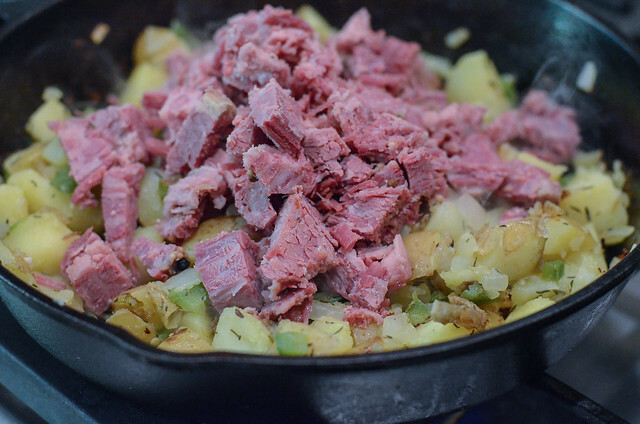 We made the Guiness Corned Beef, fantastic, and tomorrow I’m turning the rest of it into hash. I love meals that keep on giving. Many thanks. I’m glad you were able to find one! I was still seeing them at the stores around us for several days after the holidays but you just never know. Glad you enjoyed the Guinness Corned Beef. Let me know what you think of the hash! 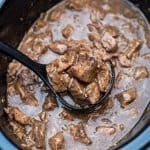 I’ll never eat canned hash again! Thanks, Val! 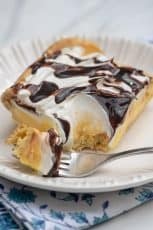 Thank you for the nice recipe and Happy Valentine Day to you.